Today, I want to share my top five reasons to be an Army First Sergeant. If there’s one job in the Army I would have LOVED to have, it would have been the First Sergeant job. Even though I was a commissioned officer (prior service enlisted) my heart was always with the enlisted guys, especially the old school NCOs. The First Sergeant’s job is the toughest job in the Army and quite perhaps the most important. The job comes with great prestige and also a big personal sacrifice. Whenever I talk with retired NCOs, they always tell me that their favorite job in the Army was when they were a First Sergeant. Even though the job was tough, they enjoyed leading and mentoring NCOs and Soldiers. They enjoyed being where the rubber meets the road! In the paragraphs below I want to share my top five reasons to be an Army First Sergeant. 1) Lead Soldiers – First Sergeant’s lead Soldiers and NCOs. It’s one of their most important tasks. They set the example, assign tasks, handle discipline issues, take care of Soldier issues, and support their subordinates. When you have 50 to 200 Soldiers to support, you can see that this is a challenging task. First Sergeants are normally the essence of leadership. They are the tip of the spear in their units. 2) Develop Others – Another great thing about being a 1SG is that you can develop your subordinates. You can leave a favorable impression on your young Soldiers and teach them what right looks like. You can groom future leaders and prepare them for positions of increased responsibility. You can create mentorship programs, do counseling, and spend one-on-one time with your subordinates to help them realize their potential. 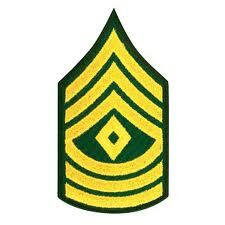 3) The Tradition – The First Sergeant rank has a proud tradition dating back many years. It’s a time honored tradition that many great leaders before you have participated in. It would be a great honor to know that you are part of that time honored tradition. 4) The Prestige – When a 1SG enters the room, it gets people’s attention. First Sergeants are respected highly by officers, NCOs and junior enlisted Soldiers alike. It might be the most highly regarded rank in the Army! This is a reflection of the respect that military personnel have towards this duty position/rank. 5) The Responsibility – When you look at the First Sergeant’s duties and responsibilities, you will quickly discover that they have a huge responsibility; more than an ordinary person could handle. This includes handling pay issues, recognizing Soldiers, individual training, morale, discipline, esprit de corps and much more. Here is a complete list of 1SG duties. Sometimes, I don’t even know how they get it done! While some people shy away from this responsibility, most First Sergeant’s love it! It brings out the best in them and challenges them to be the best they can be! Of course, there are my other reasons to be an Army First Sergeant, but these are my top five reasons. On a side note, I understand that being a First Sergeant does not appeal to everyone. And that’s perfectly okay. If you don’t want to be a First Sergeant, you shouldn’t be one! But if it’s something you have always desired to do, set a goal to become a First Sergeant and work toward it. In conclusion, my top five reasons to be a 1SG are to lead Soldiers, to develop Soldiers, the tradition, the prestige and responsibility. If you have ever served as an Army First Sergeant before, I would love to get your input. What did you love most about it? What tips can you recommend to people currently serving as First Sergeants? To share your thoughts just leave a comment to this post. Also, if you have any questions about 1st Sergeant responsibilities, you can ask them here. Thanks. I am currently elserving as a 1SG and have been for the last year. I can honestly tell you that it is the most challenging position I have ever held but the most rewarding. Recommending and approving Soldier to attend a promotion board and the. Being able to sit in that chair asking them question, watching their confidence build, and ultimately smash the board and leave with that promotable status. Makes the job worth it. Some challenges are coaching and mentoring subordinate NCOs about proper writing of awards and NCOERs, conducting NCOPD, and ensuring they council their Soldiers and their subordinate NCOs. Tracking the medical readiness, sponsoring incoming Soldiers, sending Soldiers to school, their physical fitness, all of their training…it’s in my hands. It’s a love hate relationship with the position. More love though!! Thanks for the great comment, Nick. Enjoy your time at the top! The Army First Sergeant and also known as 1SG has so many movies and tv shows dating from the beginning of media through present day dedicated to or involving them such as Sergeant Elias in Platoon, Sergeant Hartman in Full Metal Jacket, and Sergeant. Hulka in Stripes. Perhaps another good reason to be an Army First Sergeant is … as in Drill Sergeant … is the opportunity to wear the traditional campaign hat, the brown round or smokey bear. Drill Sergeant is a position held by NCOs from E5 and up in basic training units to mold civilians into Soldiers. First Sergeants are the top dog in the unit, hence, their rank as FIRST Sergeant. From your description of a First Sergeant’s responsibilities, I can see why it is arguably the most respected rank. For those entering the Army to lead and to be challenged, it sounds as if First Sergeant should be considered as an ultimate goal. I think it would be important to hear feedback from other First Sergeants to see if the goal suits you just as it would be important to similarly research every potential position. What options would a First Sergeant have if he/she decided they wanted a change? 1SG can spend several years in that billet, and many move on to Battalion/Brigade staff positions as a MSG before becoming a SGM/CSM. The 1SG and CSM positions are very prestigious and a true honor. I am lucky enough to have worked with some of the ARNG’s most impressive senior enlisted leaders. One thing they all have in common is that they treat their subordinates with true respect and always display their care for their Soldiers. They might have different styles of leadership, but that respectful treatment of Soldiers always comes through. That means that they don’t see their rank as entitlement and making them better than everyone else. They view their rank as a responsibility to do their best and to make sure everyone subordinate to them gets their best efforts. I agree with you Candace. The best First Sergeants I worked with always cared about their soldiers and looked at themselves as servant leaders. This is a great, succinct explination of the benefits of becoming an army first sergeant. Easy to read, clearly outlines the benefits and responsibilities of leadership. Very inspiring.